Mickey’s best friend starred in his own very popular cartoon short subjects, made during the height of the Disney Studio’s first golden age of animation. Featuring fast-paced comedy and lush animation, Pluto’s shorts easily stand on par with those of Mickey Mouse, Donald Duck and Goofy. Here are many of Pluto’s most entertaining animated shorts from the 1930’s through the 1940’s. Bonus materials include "The Story of Dogs" featurette; Pluto character designs and production art, and much more. 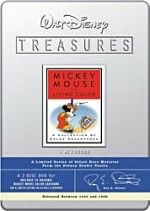 Hopefully the Walt Disney Treasures line will continue long enough to get out most - if not all - of the studio’s classic shorts. 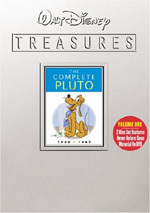 With the newest offering, we get The Complete Pluto, Volume One, a package of cartoons that feature the adorable pooch. Pluto packs an extensive roster of shorts. It presents 28 cartoons, and these span a period of 17 years. We start with Pluto’s first appearance in 1930’s “The Chain Gang” and progress through 1947’s “Pluto’s Housewarming”. For each short, I’ll offer the following information: the year in which it was produced and its director. I’ll also provide a quick synopsis of the cartoon plus my number grade for each one done on a scale of 1 to 10. Note that eight of the shorts appeared on prior DVD sets. When that occurs, I’ll cite the package that previously included the cartoon. The Chain Gang (1930, B. Gillett - first on Mickey Mouse in Black and White): The only black and white piece in this set, this short places Mickey as a prison inmate and Pete as a prison guard, though this shift doesn’t alter their personalities. Pete remains sadistic, while Mickey acts as a poor schmoe. Pluto debuted back in “The Chain Gang”, but not in the form we’d come to know and love. Indeed, in that short he played a police dog who helped track the escaped Mickey! Actually, there are two dogs who look identical, so Pluto doesn’t even muster a distinct personality or appearance in this lackluster short. 4/10. On Ice (1935, B. Sharpsteen - first appeared on Mickey Mouse in Living Color): Mickey, Minnie, Donald and Goofy go out for a day of skating on a frozen pond. You’ll notice I didn’t mention Pluto in that synopsis. He plays a supporting role, though I guess one could argue there are no leads in this ensemble piece. Donald straps skates to Pluto’s paws and delights in the pooch’s difficulties. It presents some creative shots, so although it lacks a real story, it’s a good one. However, I don’t understand why it’s in this set; it’s not really a Pluto short, and it’s already appeared elsewhere, so it doesn’t need to be here to complete anything. 7/10. Pluto’s Quin-Puplets: (1937, B. Sharpsteen): Pluto and his wife raise five puppies. The mischievous furballs make this tough on the proud papa. “Pluto and his wife”? That comes out of nowhere, doesn’t it? And goes nowhere, at least in regard to future endeavors. We’d never see the pups again, while Mrs. Pluto would only make a few more appearances - and not necessarily in that role. This short’s heavy on the cute stuff and light on much real cleverness, though Pluto’s battle with an air hose is good. 5/10. Beach Picnic (1939, C. Geronimi - first appeared on The Chronological Donald, Volume One): Donald uses an inflatable water toy to torment Pluto and entertain himself. In addition, rampaging ants overrun his picnic spread. This leads to decent visual humor but not much of a story and a mediocre short. 5/10. Bone Trouble (1940, J. Kinney - first appeared on Lady and the Tramp 2): A hungry Pluto tries to steal a bone from another - much tougher - dog. Pluto seems like the most challenging Disney regular to do because he doesn’t speak. Virtually all of his thoughts and emotions need to come out via pantomime. “Trouble” is an effective demonstration of those techniques done well. It works from the thinnest possible story but manages to churn out some good laughs. 8/10. Pluto’s Playmate (1941, N. Ferguson): Pluto meets a seal on the beach and runs into frustrations with the playful critter. As with the short that featured Pluto’s pups, cuteness reigns here, though Pluto displays a lot of anger aimed at the innocent seal. That dark side gives the short a little bite. 6/10. Canine Caddy (1941, C. Geronimi): Pluto assists as Mickey plays golf. A cartoon that could have appeared on a Mickey Mouse collection, “Caddy” is another of those with no clear lead. Pluto plays a more active role than Mickey, though, and most of the humor revolves around him, especially when he confronts a pesky gopher. 7/10. Lend a Paw (1941, C. Geronimi - first appeared on Oliver and Company): Pluto tries to deal with the presence of a kitten he inadvertently rescued from a river. It’s a cute offering that works fairly well. 7/10. Pluto, Junior (1942, C. Geronimi - first appeared on Lady and the Tramp 2): Pluto hangs out with his son. So what happened to the other four pups from the earlier cartoon? And where’s mama? All questions remain unanswered. Unsurprisingly, cuteness rules here, as the adorable little Pluto gets in various forms of mischief. It’s not very entertaining. 4/10. The Army Mascot (1942, C. Geronimi - first appeared on Walt Disney on the Front Lines): Pluto competes with a goat for the position of division mascot. One of the shorts connected to World War II, “Mascot” is a crazy, inventive winner. 9/10. The Sleepwalker (1942, C. Geronimi): A hungry female dachshund tries to steal Pluto’s bone. He stops her, but in his sleep, his love for her emerges and he gives her the bone. Awake, he recalls nothing and the two battle again. Once again, Pluto’s romantic/family situation confuses, but I gotta give this short credit for a creative concept. No, sleepwalking’s not original, but the way it confuses things in regard to his relationships makes the cartoon fun and even kind of touching. 8/10. T-Bone for Two (1942, C. Geronimi): A hungry Pluto tries to get a bone from a ferocious bulldog. Yeah, it’s the same plot as “Bone Trouble” - and the same antagonist - but the story works fine even in its second incarnation. In fact, “Two” may be even more creative and inventive, as it provides a lively outing. 8/10. Pluto at the Zoo (1942, C. Geronimi): As he walks past the zoo, Pluto sees all the great bones the animals there get to gnaw, so he tries to steal one from a lion. “Zoo” has a lot of potential but doesn’t live up to it. The setting creates all sorts of possibilities it fails to explore. Part of the problem comes from the weak definition of the zoo animals, as they don’t go much of anywhere. It’s clever enough to be entertaining, but it’s not great. 6/10. Pluto and the Armadillo (1943, C. Geronimi): On a tourist stopover in Brazil, Pluto encounters a playful armadillo. Another in the cutesy vein, “Armadillo” provides some minor pleasures at best. Outside of its unusual setting, it doesn’t present much to make it stand out from the crowd. 4/10. Private Pluto (1943, C. Geronimi - first appeared on Walt Disney on the Front Lines): Pluto gets the assignment to guard a pillbox. Look for some chipmunks who may be precursors to Chip an’ Dale. The short uses the standard “Pluto vs. wildlife” motif but gets into the military machinery in a fun way. 7/10. Springtime for Pluto (1944, C. Nichols): Pluto encounters the various evolutions that occur in the spring, including a caterpillar that turns into a butterfly. More musical than usual for a Pluto short, it proves fairly creative. It’s not a terribly funny short, but it earns points for inventiveness. 7/10. First Aiders (1944, C. Nichols): Pluto battles with Figaro the cat for Minnie’s attention and affection. Yeah, the cuddly kitty makes for another cute rival. However, he’s a little more malicious than most of the animals Pluto encounters, and that gives “Aiders” some bite. 7/10. Inconsistent political correctness alert: while an extremely vague black stereotype puts “Gentleman’s Gentleman” in the category of “controversial”, here we see Pluto briefly transformed into a very stereotypical Chinese coolie. Why doesn’t this one have some kind of disclaimer attached? Dog Watch (1945, C. Nichols: Navy dog Pluto gets the assignment to guard a ship. His main foe comes from a tough rat. After all those shorts with sweet animals, it’s good to see some who stand up to Pluto. Indeed, this one’s rat firmly controls the action. 7/10. Canine Casanova (1945, C. Nichols): Pluto tries to woo an aloof dachshund. Geez, Pluto’s kind of a player, isn’t he? Actually, I guess this is supposed to be the same dachshund he met back in “Sleepwalker”, though the two don’t like they’ve met. In any case, it’s a cute though unexceptional short. 6/10. The Legend of Coyote Rock (1945, C. Nichols): Pluto tries to protect a flock of sheep from a hungry coyote. Whereas most Pluto shorts are essentially silent, this one presents lots of narration; none of the characters speak, but it’s decidedly denser in verbiage than usual. That actually slows down the short. Virtually all the narration is unnecessary from a story-telling point of view, though it adds to the piece’s western flavor. 5/10. Canine Patrol (1945, C. Nichols): Pluto befriends a baby turtle and tries to keep him safe from harm. “Patrol” takes Pluto back to “cute” territory and does so with satisfying results. Indeed, the unnamed turtle is one of Pluto’s most endearing pals, and this ends up as a charming little short. 7/10. Pluto’s Kid Brother (1946, C. Nichols - first appeared on Lady and the Tramp 2): We follow Pluto’s younger sibling as he gets into various misadventures. Pluto doesn’t have a lot to do here, as the flick mainly focuses on his mischievous brother. Perhaps Disney hoped to create some spin-offs that involve KB, but I don’t think that happened. This short isn’t anything special, as it follows the same lines as most Pluto cartoons, just with another participant. 5/10. In Dutch (1946, C. Nichols): Set in Holland, Pluto delivers milk bottles and falls for yet another alluring dachshund. The change of setting from unspecific America to Europe is odd, but it allows the short to come across as something different, and it’s not like we expect logical continuity from these cartoons anyway. The Dutch locale adds some nice scenery and a few fun options. 7/10. Squatter’s Rights (1946, J. Hannah): Mickey and Pluto take a trip to their cabin where the pooch contends with rascally Chip an’ Dale. Those two bring out the best - or worst - in Pluto and finally give him foes who are both cute and lively. They help make this a fun short. 8/10. The Purloined Pup (1946, C. Nichols): Butch the bulldog kidnaps a wealthy pooch, so police dog Pluto gets the case to find him. Most Pluto shorts worry more about gags than stories, so it’s nice to see one that actually attempts a plot. Granted, the feel remains similar, but at least there’s more going on here than just Pluto’s vague shenanigans. It ends up with a tone closer to Looney Tunes than usual as well and is a lot of fun. 8/10. Pluto’s Housewarming (1947, C. Nichols): Pluto moves into a fancy new doghouse but has to contend with an intrusion from the cute turtle of “Canine Patrol” and others who want the home for themselves. That turtle doesn’t work as well in his second outing, partially because he seems a little mean here. The short’s still fairly inventive, though, and a pretty good piece. 7/10. DVD Two includes two additional shorts that it places in a section called From the Vault. It appears Disney put these two cartoons in a separate area due to controversial elements. Leonard Maltin introduces this domain with a 50-second clip that puts them in historical perspective. One major annoyance: the DVD makes it impossible to skip this introduction. You can’t chapter search past it, you can’t fast forward through it, and you can’t even return to the main menu! That’s absurd. Are the folks at Disney so worried that audiences will become corrupted or offended by the content that they force us to listen to Maltin’s generic introduction? Pantry Pirate (1940, C. Geronimi): Pluto risks life and limb to steal some tasty grub from a kitchen. The short’s potential controversy comes from a black “mammy” character. The cartoon itself is pretty standard Pluto fare. He tries to stay out of trouble but still get what he wants in this decent but unexceptional piece. 6/10. A Gentleman’s Gentleman (1941, C. Geronimi): Pluto goes to the corner to get Mickey a newspaper but doesn’t do this well. Only one quick shot in which vaguely looks like a stereotypical black child winds this one up in the “forbidden” area of the DVD. I understand the concerns about “Pirate”, but this one’s alleged racism is extremely slight and would have gone by unnoticed. The short itself is entertaining but not special. 6/10. 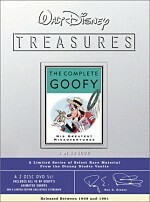 The Complete Pluto, Volume One appears in an aspect ratio of 1.33:1 on these single-sided, double-layered DVDs; due to those dimensions, the image has not been enhanced for 16X9 televisions. One of the most attractive collections of Disney shorts to date, Pluto displayed very few problems. Sharpness consistently looked good. Virtually no instances of softness occurred. Instead, the shorts stayed detailed and well-defined at all times. Jagged edges and moiré effects caused no concerns, and I saw no edge enhancement. Whereas print flaws usually cause concerns with older clips, here they seemed extremely minor. I noticed an occasional speck and a hair or two, but little else intruded. Instead, the shorts stayed very clean and fresh. Colors consistently seemed strong. The tones were bright and vivid throughout the shorts, with very few exceptions on display. The cartoons stuck largely with primary colors, and these looked quite distinct and vibrant at virtually all times. Black levels also appeared nicely deep and rich, while shadow detail was clear and accurate throughout the shorts. Overall, I was extremely pleased with the quality of Pluto; it seemed hard to believe that these cartoons were all so old. The monaural audio of The Complete Pluto showed some age-related concerns, but the sound seemed fine considering its vintage. Dialogue was a minor concern since so little speech popped up in the shorts. When lines appeared, they were perfectly fine, with no issues connected to edginess or intelligibility. Effects stayed fairly clean and distinct through the shorts. They didn’t present much range, but they also lacked any notable flaws like distortion or roughness. Music seemed reasonably solid. The scores were relatively thin but they showed decent breadth and definition given their age. A little hiss showed up at times, but otherwise the audio didn’t suffer from noise issues. Overall, the sound heard during Pluto won’t win any awards, but I found the mixes to come across as pretty clear and accurate for their age. 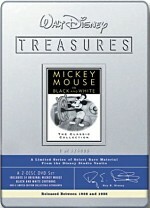 As with all the “Walt Disney Treasures” releases, The Complete Pluto features a smattering of supplements. On DVD One, we start with an introduction from Leonard Maltin. In this one-minute and 56-second piece, the film historian gives us a quick history of Pluto and his development. Next we find a featurette called The Life and Times of Pluto. In this nine-minute and 16-second piece, we see clips from shorts, archival bits, and interviews. We hear from Maltin, animators Frank Thomas, Ollie Johnston, and Andreas Deja, and animation historian John Canemaker. They discuss the character’s origins, his development, and aspects of his personality. Some technical elements receive attention as well. The piece follows a somewhat scattershot approach, as it doesn’t follow a particularly concise line, but it tosses in nice information and educates us about various Pluto-related issues. DVD One also presents Pluto 101. The 11-minute and 53-second featurette includes a chat between Maltin and Deja. The latter chats about the character and then demonstrates the techniques necessary to draw Pluto. This gives us a nice “hands on” look at the methods used to bring him to life. As we move to DVD Two, we start with another introduction from Maltin. This one lasts 65 seconds, as he discusses the character through the years. After this we get an excerpt from the Disneyland TV show. From a December 1, 1954 episode to promote Lady and the Tramp, Pluto’s Picture Book offers a minor tribute to the pooch. It runs 29 minutes and 13 seconds and essentially presents little more than a compilation of clips from Pluto shorts. Walt Disney’s narration makes this moderately interesting for archival reasons, and a few of the connecting elements between cartoons offer some fun. However, since we mostly just watch shorts that we can find in better shape elsewhere, there’s not much to entertain here. The 10-minute and one-second featurette Pluto’s Pal Fergy looks at Norm Ferguson, the animator who helped shape Pluto’s personality. Hosted by Maltin, we get notes from Thomas, Canemaker, and Deja. The program covers Ferguson’s early life and career, his entrance into animation and his progression in the field, his style and his techniques. Despite a short running time, we get a nice feel for Ferguson’s work and influence. “Pal” presents a tight and very informative examination of Ferguson’s skills. After this we get threeGalleries. We find “Pluto on Paper”, which features eight Sunday comic strips. These can be viewed all at once or panel to panel. The area includes an additional 13 frames that depict book and magazine covers. We also discover “Pluto’s Posters” (18 frames), “Background Paintings” (15), and “Animation Drawings” (52). These all add up to a nice set of materials. Finally, the DVD’s booklet includes a short text overview from Maltin as well as some archival images. An insert card also displays a reproduction of the poster for “Bone Trouble”. While never as big a star as Mickey or Donald, Pluto held his own through his career. Indeed, he often forced Mickey to play second fiddle in the Mouse’s own shorts. The Complete Pluto, Volume One presents a fairly good collection of the dog’s efforts through the years. The DVD features excellent picture with perfectly acceptable audio and a moderately interesting set of extras. Disney have done well with these releases, and Pluto is another one that earns my recommendation.